Diamond Queen is a popular online video slot game from IGT (International Game Technology) that has been released in May 2012. This online video slot machine game has 5 reels and 20 pay lines. The theme of Diamond Queen is, as its title suggests, all about the magical world of the Diamond Queen, her trusty Wizard and the wizard’s apprentice. Whenever there is a new diamond-themed slot game being released, most people typically sigh and say – “Another unimaginative slot game full of boring diamonds.” However, once they give the Diamond Queen online slot game a try, they will definitely realize that it is much different and will understand why it proudly stands out in the crowd. Why not give this slot game a spin? It will surely be worth your while! Many online slot players usually would like to play for free first every time they come across a new online slot game so that they can find out if they like that game enough to spend real money in it. Hence, whenever they see that a particular slot game is powered by IGT, they are certain that they can instantly play that game, without the need to download anything! Enter the enchanted world of the Diamond Queen, where diamonds are overflowing and so are your potential wins! Diamond Queen features scatter wins, wild substitutions, a great Free Spin bonus game that has plenty of Stacked symbols and Locked Wild reels, and last but not least, it has a 92.97% up to 96.08% payout ratio! Since IGT manufactures roughly half of the slot machine games in the United States, it is not surprising that their games are well-liked and popular amongst avid slots players – whether they are playing land-based, online, or mobile slots games. IGT offers great quality graphics and realistic sound effects in their collection of online video slot machine games. In Diamond Queen, they have really done a very good job of incorporating a video slot game together with a royal “diamond” theme, considering the fact that diamonds are sort of overused in slot game themes. The symbols are in 3D and they become animated whenever you hit winning combinations with them. For instance, when you form a winning combination with the Diamond Queen herself, she waves her diamond scepter; and the blue-clad Wizard makes a big diamond float magically in mid-air! The symbols are vibrant and even if they are in a dark color, you will still play for a long time as it does not strain your eyes. The overall graphic design of Diamond Queen features many different colors including blue, green, red, pink, yellow, orange, white, and of course, the royal purple. There is no initial constant background music that you will hear while playing the Diamond Queen online slot game. When you spin the reels, you will hear tinkling sounds similar to old arcade games, and when you get to form winning combinations, varying celebratory music will be played. The card deck symbols available in the Diamond Queen online video slot game are J, Q, K and Ace. The regular symbols that you will find in Diamond Queen are the Diamond Queen Logo, the Wizard, the Apprentice, the Sceptre and the Tiara. The Wild Symbol is the Diamond Queen herself. The Diamond Queen wild symbol acts as a substitute for all other symbols (except for the scatter symbol) in order to help you complete a winning combination. The Diamond Queen wild symbol only can be found on the 2nd, 3rd, 4th and 5th reels in the main Diamond Queen slot game. The Scatter Symbol is the Mystical Diamond Bonus symbol. A scatter symbol is not required to appear in a line (on an enabled pay line) for you to win. The Mystical Diamond Bonus scatter symbol can be found only on the 2nd, 3rd, and 4th reels. You will be awarded scatter wins if you get Mystical Diamond Bonus scatter symbols to appear on the 2nd, 3rd, and 4th reels for any number of played lines. For any 2 Mystical Diamond Bonus scatter symbols that you get in a winning combination, you are awarded 2x your total bet. Your winnings are calculated via multiplying the Mystical Diamond Bonus scatter symbol combination payout (refer to Paytable) by the total number of coins you’ve bet. 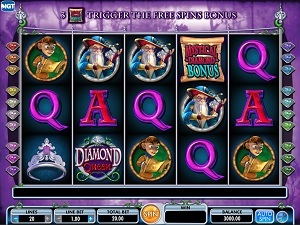 If you hit 3 Mystical Diamond Bonus scatter symbols on the 2nd, 3rd and 4th reels simultaneously, you will activate the Mystical Diamond Free Spin Bonus Feature game. Please take note that if you obtain a scatter win and a regular win, you are then paid out for both of these winnings, because the Mystical Diamond Bonus scatter symbol is not required to come out on an enabled pay line for you to win. Scatter wins are included to the pay line wins. Mystical Diamond Free Spin Bonus Feature Game – If you manage to get 3 Mystical Diamond Bonus scatter symbols to come out (on the 2nd, 3rd, and 4th reels) simultaneously, you will activate the Mystical Diamond Free Spin Bonus Feature game. Please take note that all of the bets and pay lines played in the Free Spins are exactly the same as the spin that triggered the Mystical Diamond Free Spin Bonus Feature game. When the Mystical Diamond Free Spin Bonus Feature game is being played, the Locked Wild Reels will become active – the Free Spin bonus game will start with the 2nd reel having all Wild symbols for the first spin. The second spin has the 2nd and 3rd reels entirely wild, and the third spin has the 2nd, 3rd, and 4th reels entirely wild! If an Extra Spin symbol lands on the first reel, an extra free spin is played at the current wild reel state. Up to 20 extra Free Spins can be earned per Mystical Diamond Free Spin Bonus Feature game, which means you can easily achieve winning combinations that generate big winning possibilities! When the Mystical Diamond Free Spin Bonus Feature game is over, you will be taken back to the main Diamond Queen online video slot game, and your winnings garnered from the Free Spin games are included to your overall balance. Diamond Queen has 5 reels where you may bet on 20 pay lines. The minimum bet is 0.01 and the maximum bet is up to 10.00. You can wager only 1 coin per pay line bet. It is absolutely more fun and easy when there is an Auto Spin function available in online slot games! In Diamond Queen, you can access their Auto Spin function by clicking on the Auto Spin button on the lower right corner of the screen. You are given the choice of how many spins you would like the game to do automatically for you – from as low as 10 up to as high as 50 Auto spins. When you choose a number, say 20, the Auto spin will keep track of the remaining number of automatic spins. The Auto Spin will stop only when a Bonus is triggered or the balance is insufficient to spin again. Also, you are actually given the option to stop the Auto Spin yourself, just in case you want to.